The 10 Best Ice Cream Parlors in Maryland! 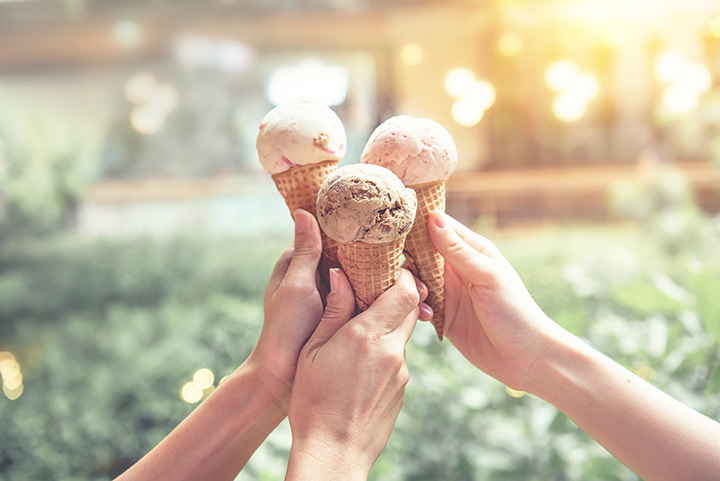 From long-running family farms making some of the freshest dairy around, to shops serving up delicious ice cream cakes, the best ice cream parlors in Maryland must be experienced. If you haven’t tasted farm-fresh ice cream yet, you have to. Check out our 10 favorites! When visiting Annapolis, you can’t leave without a scoop of ice cream. It’s the thing to do, especially in the hot summers. With so many ice cream shops to choose from, you have to know where the locals go—Annapolis Ice Cream Company. With 36 flavors that rotate, you are going to find a classic you love and something new to try like their key lime or banana chocolate chip. Delicious ice cream made from the cows grazing in nearby pastures makes for a taste so fresh you can’t believe it. Ice cream from the store cannot come close to comparing with the rich creaminess you will taste at Rocky Point Creamery. No matter where you live in Maryland, this is worth the drive. For something fun and unique, head to Opie’s. Here you can get incredible soft serve and classic Maryland snowballs. You can even get a homemade ice cream cookie that is incredible and like nothing you can buy in the store. Creamy, delicious and fantastic, Opie’s is a generational favorite that locals wait for all winter long. The Kilby family has been dairy farming for over 100 years and it shows. They produce ice cream that is too good to be true, only it is. Rich and creamy with fantastic flavors, you can expect nothing but the best when visiting the ice cream shop on their family farm. They even offer delivery now so you can enjoy the Kilby flavor at your next birthday party, family wedding, etc. This is natural ice cream with no unnecessary ingredients, where even the cows are on an all-grass diet to ensure that you are eating the least processed ice cream possible. The Prigel family believes in organic farming and natural products so when you come for a scoop of ice cream, you are enjoying something fantastic while also supporting farming the way that is good for you, the earth, and the cows. Not many ice cream shops serve ice cream cakes. However, Hoffman’s does. Here you can buy fresh homemade ice cream and ice cream cakes that everyone in the family will ask for again and again. Once you have ordered one of their cakes, it will become a staple at every birthday party. This fun, local, Baltimore haunt is a fan favorite and the perfect spot to cool off during a summer day in the city. You can host birthday party’s here and other events plus they are open year-round, unlike some of our other favorites. They are all about serving happiness and it shows in how friendly the staff is. Try one of their ice cream shakes to go—they are fabulous! They only use fresh, local ingredients so the ice cream is far superior to what you would taste at a chain. The craziest thing about Highland Creamery is that they offer 600 flavors! That’s right—600! It’s insane and you are absolutely going to find several that you can’t live without. Try their mascarpone for something truly creamy and unique. You can see the cows who gave the milk for your ice cream when visiting the ice cream parlor at Chesapeake Bay Farms. This relaxed country setting is perfect for children running around and burning off all that sugar, while parents can unwind in the sunshine and enjoy their second scoop. You can also purchase butter, milk, and ice cream to go. The best soft serve in the state can be found at Julia’s Ice Cream in Ocean City. This is a treat you want to have year-round but it certainly makes for a perfect day at the beach. Try their creamsicle for incredible flavor that you can’t find anywhere else. It’s a classic, just like Julia’s.